The apartment is very well situated, just 500m away from the popular Beach of Sancti Petri (perfect for water sports, kitesurf, windsurf, kayak…). Quiet and beautiful area. Little commercial centre next to the apartment, with cafeteria, restaurant, tapas bar. Recently painting, inside and outside. Private terrace with table and chairs pool view. Fenced and guarded pool (open seasonally). Wide parking area in front of the apartment. We stayed out of season so it was quiet and the pool wasn't open. The apartment was clean and fully equipped. The owners were very accommodating and helpful. Would stay again. A well-equipped apartment with everything we needed for a comfortable stay. 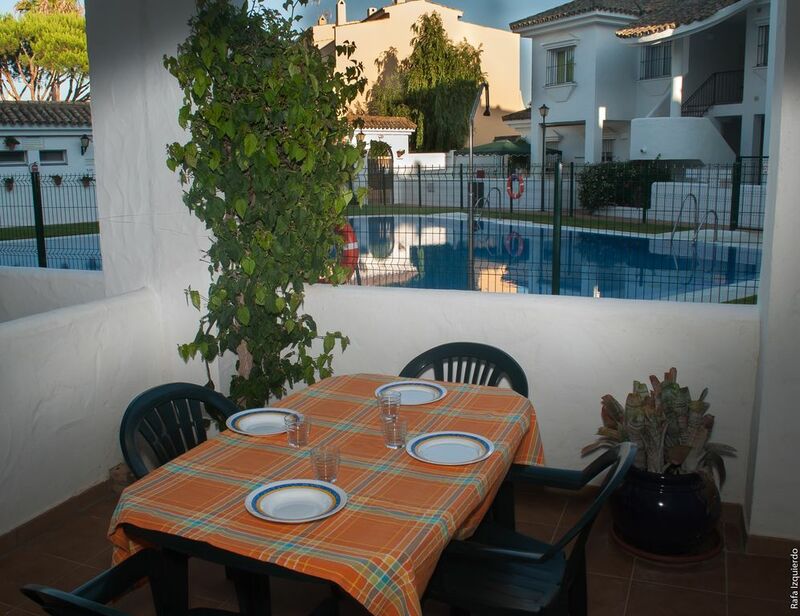 The apartment is perfectly placed and within walking distance of La Barrosa beach and the marismas are a delight for bird-watchers. Supermarkets and restaurants are close by. Cadiz, Arcos de la Frontera, Grazalema and Seville are all within reach and all are well worth a visit. This apartment was perfect for an autumn break. Hemos estado muy agusto en este apartamento. Urbanización tranquila y muy cerca de todo.La zona es muy bonita. Muy recomendable. El apartamento estaba muy limpio, la zona muy tranquila y bonita. El dueño es una persona super agradable, sin duda repetiremos. Access from Highway Sancti Petri Seville. Exit 10, Chiclana de la Frontera. At this roundabout, continue towards Playa de la Barrosa. 1 º Roundabout “Venta El Florin”. Go straight. 2 º Roundabout “Super Sol”, go straight. 3 º Roundabout “Hostal Los Gallos”, turn left, heading towards La Barrosa. 4 º Roundabout “Sancti Petri”, turn right towards Sancti Petri. Right next to the apartment. Gastro bar. "Al otro lado"
Grill restaurant at the comercial center near the apartment. In the old village of Sancti Petri can find bars offering fried fish from the bay and other tapas. La Barrosa is the most popular and big beach (8 km. ), better take the car from the apartment is 5 minutes drive, the promenade has numerous bars and restaurants. Excursions. Do not forget to visit Vejer, Conil, Jerez, Cadiz and Seville. Chiclana usually has cultural programs during the summer, and some terraces where you can sit outside to have some tapas. I recommend “Taperia del Rio”. Typical products. “Butifarra” typical saussege. Wine sweetsherry (Moscatel de Naranja), almond cakes cloistered nuns. Activities. Zaida or Novojet offer all kinds of water sports activities for all ages. But you can also ride horses or paramotor. (Eoloschool).